When you perform a custom Windows installation or upgrade Windows to a newer version, the old Windows folder is renamed to Windows.old in case you’d like to revert the upgrade. Windows 8 or 10 users might also have seen the Windows.old folder after performing a PC refresh. Windows.old contains not only your old Windows installation files, but also your old Documents, Settings and Programs. The folder is usually gigantic in size and can take up considerable space in your system partition. So if you are pretty sure that you no longer need any data from Windows.old then it would be a wise decision to delete it. Unfortunately, you can’t remove the Windows.old folder by simply pressing the Delete key because your user account doesn’t have ownership of the folder. Here’s how to take ownership all files and subfolders in Windows.old, so you can then delete the whole folder to reclaim some space. How to Delete the Windows.old Folder? 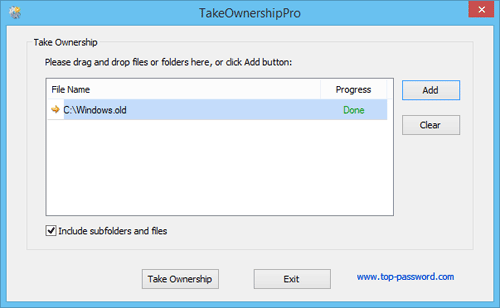 Download and install the freeware TakeOwnershipPro on your local computer. Start the TakeOwnershipPro program and drag the C:\Windows.old folder to the program. Tick the “Include subfolders and files” box. Click Take Ownership. The program will begin to take ownership of all files and subfolders in the Windows.old folder. It could take you one or two minutes, depending on number of files and folders it contains. Once it is done, you can then delete the Windows.old folder without any permission issue. It’s that simple. Deleting the Windows.old folder can save you quite a large amount of hard disk space and it will not affect the present state of the new OS. There might be situations where you need to delete some folders or files contains special characters in the filenames. 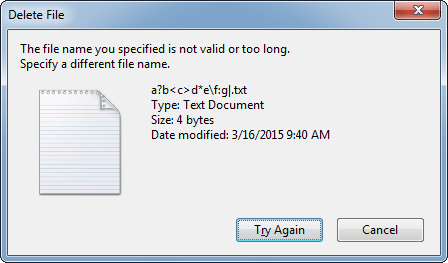 When you try to delete, move or rename such a folder/file from Windows Explorer, you’ll receive the error message “The file name you specified is not valid or too long“. Or get a similar error message “The filename, directory name, or volume label syntax is incorrect” when you try to delete the folders/files from Command Prompt. Almost all Windows apps are unable to process these stubborn files. To get around this problem, you need to use a Ubuntu Live CD or Linux distribution. In my example, I boot my computer from Ubuntu Live CD and I can then easily create, open, rename or delete any folders or files with special characters. Almost anything (only the / character is not allowed) will be allowed in the filename after booting to Linux or Ubuntu. Using this method, you can delete or rename any Windows folders/files located in your hard drive. Have you ever worried that a hacker could figure out your login password through a password-guessing attack? Here’s how you can prevent this by temporarily locking your account when the wrong password is entered several times. Account lockout threshold is basically a feature of Windows that allows you to lock your user account after a number of failed login attempts. In this article we’ll explain two methods of setting the account lockout threshold to limit the number of failed login attempts in Windows 8 and 7. Tips: If your account is locked out permanently and couldn’t login with any user account, you can unlock your system with PCUnlocker Live CD. To open the Local Group Policy Editor, press the Windows key + R and type gpedit.msc in the Run box. In the left pane, navigate to Local Computer Policy > Computer Configuration > Windows Settings > Security Settings > Account Policies, and click Account Lockout Policy. 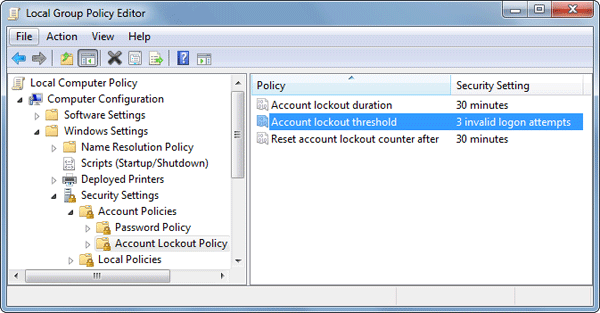 In the right pane, you will see three policy settings, named Account lockout duration, Account lockout threshold, and Reset account lockout counter after. Double-click Account lockout threshold and set the number of invalid login attempts you like between 0 and 999, click OK.
Windows will prompt you to set suggested settings for Account lockout duration and the length of time to Reset account lockout counter. You can either click OK to choose the default value or change it later. First you need to open an elevated Command Prompt. In Windows 7, right-click on the Command Prompt in the Start Menu and select Run as Administrator. In Windows 10 or 8, just press the Windows key + X and select Command Prompt (Admin). In the Command Prompt, run the command net accounts /lockoutthreshold:(0-999) and you can change the account lockout threshold. For example, I want the system to automatically lock out my account after the password is entered incorrectly 3 times, I would type in this command below and press Enter. Now, you need to set how long the account will be locked when the password is entered incorrectly. In this example, we set the computer to lock for 30 minutes. But you can choose less or more (between 0 and 99999), depending on your needs. If you set the account lockout duration to 0, then a locked out user account will be locked out until an administrator manually unlocks that locked-out account. Once you’re finished, you can run the net accounts command to review your settings. When the password is entered incorrectly a couple of times, you are restricted from further login attempts for a certain time period. After limiting the number of failed login attempts in Windows, it will prevent hackers from being able to guess your password by entering every possible password combinations continuously.